The abrupt departure of Spirit Airlines CEO Ben Baldanza in early Jan-2016 immediately generated wide-ranging conjecture that his exit was setting the stage for a merger with fellow ULCC Frontier Airlines. On paper the two airlines seem like a perfect fit, with complementary fleets and similar business models. However, the likelihood of a merger occurring in the short term is low. Both Spirit and Frontier have much to accomplish on their own before any consideration is given to combining forces. Proponents of a merger who are basing their conclusions on similar fleets and network overlap perhaps are overlooking some less tangible, but important, factors to consider in any tie-up between Spirit and Frontier. Employees at Denver-based Frontier have been through the wringer during the last eight years, facing long bouts of uncertainty as the airline struggled to find the right business model. Suffice it to say that they seek to enjoy a period of stability before undergoing the complexities of merging with another airline. Frontier also needs time to mature its ULCC model before rushing to merge with another airline simply because it appears to make sense in theory. Shortly after the CEO change at Spirit, Frontier unveiled 40 plus new routes for 2016. It is a clear message that the airline continues to seek its own growth opportunities as Spirit prepares (possibly) to hit the reset button on some its growth targets under new leadership. Since Indigo Partners chairman William Franke resigned as the head of Spirit’s board and purchased Frontier in late 2013, speculation over a merger between Frontier and Spirit has surfaced from time to time. It hit fever pitch after Spirit announced Mr Baldanza’s departure and named former AirTran CEO Bob Fornaro as chief executive, in early Jan-2016. Pundits immediately latched onto the role Mr Fornaro played in AirTran’s merger of Southwest, and concluded that he would use that experience at Spirit. The reality is that Southwest pursued AirTran, and Mr Fornaro’s accomplishments at AirTran were far greater than making AirTran an attractive acquisition target. The airline was a formidable competitor to a much larger Delta in Atlanta, for years. AirTran delivered an on-time departure rate of 85% and an on-time arrival rate of 83% in 2010, the year Southwest announced its intent to acquire its smaller rival. Mr Fornaro’s immediate priorities for Spirit should not be pursuing a merger. Under his leadership Spirit needs to improve its operations, regain lost ground on its share price, and undergo a change in customer perception. 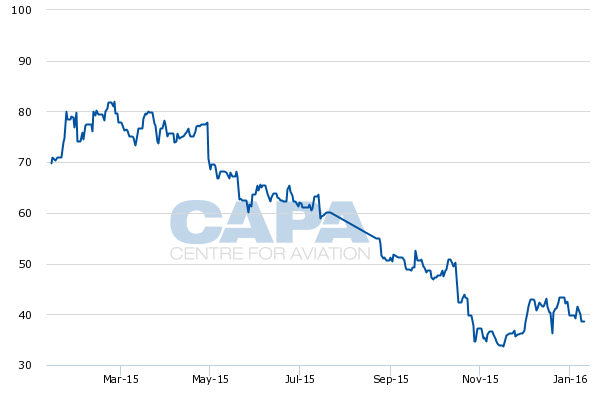 Spirit’s stock price free fall during 2015 is well documented. 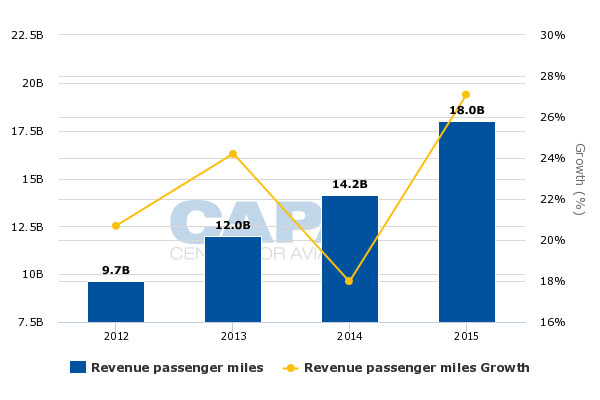 Its 30% capacity growth year-on-year, plummeting unit revenues, and two downward revisions to its margin forecast crushed the airline’s valuation, even though its operating margins for 2015 will be in excess of 20%. As of 30-Nov-2015 its share price was USD36.77, compared with a share price of roughly USD80 a year ago. It did gain some traction after Mr Fornaro was named CEO, jumping to nearly USD40 on 7-Jan-2016. The airline’s 30% capacity growth in 2015 outpaced its 27% increase in traffic, which drove Spirit’s load factors down 2ppt for the year, to 84.7%. Spirit is dialing down capacity expansion to 15% to 20% annually over the medium term, and has pledged that it can deliver operating margins in the mid-teens at that growth rate, but analysts may urge Mr Fornaro to slow SpiritSpirit’s growth even further, after all airlines added capacity in the domestic market in 2015 due to lower fuel prices. The result was a lack of pricing traction for most US airlines. One way to pull growth back is to adjust aircraft utilisation, something that Spirit is considering in order to improve its operational performance. Data from the US DoT show that Spirit’s on-time arrival rate from Jan-2015 to Oct-2015 was 68%; its on-time departure rate was 71%. In Oct-2015 Spirit had the worst on-time arrival rate among airlines tracked by the agency: 78%. Improving operations is pivotal for Spirit in 2016. If pricing in the US domestic market continues to remain soft customers will gravitate to Spirit’s competitors, offering similar fare prices and touting a higher level of operational integrity. Both Spirit and Frontier need to make significant progress in customer perception, which could only grow worse if the companies become mired in a merger before establishing consistent positive sentiment among passengers. A snapshot of DoT data shows that Frontier has made some progress. In Jan-2015 Frontier’s complaints per 100,000 enplanements were 8.61 compared with 4.21 the year prior, when it was embarking on its ULCC transition. The combining of two airlines that generate negative passenger sentiment may not be the wisest choice, at least until travellers understand the business model, being more comfortable with paying a low base fare and then picking and choosing add-ons they wish to purchase. Although Spirit and Frontier are rapidly growing, passenger understanding of the ULCC business model in the US remains low. Spirit undertook a passenger education campaign in 2014 to help customers understand its model better, but the DoT data show that so far it has not generated a lot of success. During the 2015 CAPA Americas Aviation Summit, Indigo’s William Franke admitted that ULCCs have done a pretty poor job of educating passengers about their approach. Frontier has distinguished itself somewhat from Spirit by offering bundled fares that include one free checked bag, refundable tickets or stretched seating. However, Mr Franke remarked that the traveling public largely prefers the unbundled fare. Frontier is roughly two years into its ULCC transition. To consider a merger before its ULCC operations have reached a certain level of maturity – two to three years – would be ill advised. The reality is that Frontier has gone through many iterations in a short period of time. From its Chapter 11 reorganisation to an acquisition by Republic Airlines (which resulted in a move of Frontier’s headquarters from Denver to Indianapolis for a short period of time), it has now just found its footing in the ULCC space. The airline’s employees need some time of stability before being thrust into a merger and the tedious process of combining seniority lists of labour groups. Frontier needs to settle into the ULCC model and demonstrate that it can get its costs to appropriate levels, while generating strong top line profits. Data from DoT show that Frontier’s net income in 2014 was USD129 million and its operating revenues were USD1.6 billion. For the 10M ending Oct-2015 its net income was USD114 million and its operating revenue was USD1.2 billion. At the time that Indigo acquired Frontier (late 2013) the airline’s unit costs excluding fuel were USD7.7 cents. Mr Franke has previously declared that unit costs below USD6 cents are key for ULCCs. In Jan-2016 a Frontier executive told Raleigh-Durham news outlet the Triangle Business Journal that the airline has lowered its unit costs, excluding fuel, by 25% during the last two years. In early Jan-2016 Frontier opted to unveil a network blitz, announcing 42 new routes, beginning in Apr-2016 and continuing through Jun-2016 (see background info). Most of the routes have a minimum of two competitors, largely American, Delta, United and Southwest. Frontier is competing with Spirit on five of the new routes, Alaska on four and a single route each with JetBlue and Allegiant. It is the sole operator on four of the new routes. The biggest overlap is with American, which has been the most vocal about the ULCC threat during 2015. American has stated that it would match ULCC fares, and is working on a fare family product similar to Delta’s, offering a bare bones option to compete with ultra low cost rivals. Frontier’s latest network expansion indicates that for now it does not feel threatened by heightened attention from legacy airlines. Frontier’s frequencies on the new routes fall between three and four per week. This is a slightly different approach from Spirit’s – which is typically one to two daily flights on a route – but the existing operators on those routes will compete fiercely with Frontier and any other new entrant. 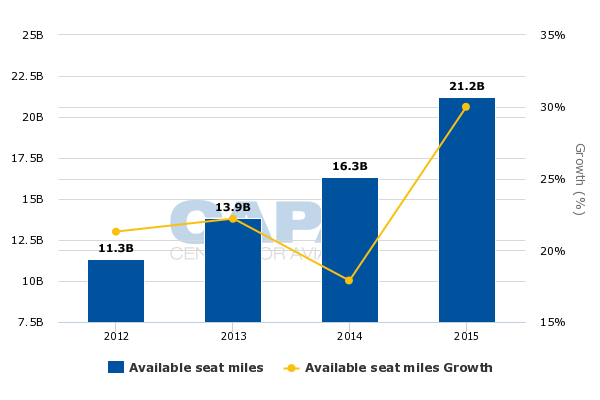 One trend to watch in 2016 is how the competition between legacy airlines and ULCCs intensifies. Privately held Frontier likely experienced some of the revenue pressure Spirit endured, but was buoyed to profitability by lower fuel costs. Some proponents for a merger between Frontier and Spirit believe that a combined airline would be better equipped to compete with the largest US major airlines – American, Delta, United and Southwest. The reality is throughout 2015, and during early 2016, most US airlines were suffering from a loss of pricing traction in some areas of their domestic networks, regardless of size. A sudden CEO shake up always draws much attention and much conjecture about the reason for the change. Mr Baldanza successfully guided Spirit to being the first US airline to execute the ULCC model on a large scale basis while posting record financial results, but the tenure of most successful CEOs is not infinite. This was the case with former JetBlue CEO Dave Barger, who left the airline a year ago. A merger between Frontier and Spirit could make sense in a number of years. But the last thing Spirit’s employees need after watching their former CEO make a quick exit is to have concerns that a merger is imminent. Instead, Mr Fornaro needs to focus on numerous improvements to Spirit as a stand-alone company before opening a new chapter in US consolidation. Phoenix-Seattle: Four times weekly service to launch on 29-Jun-2016, using A319 aircraft. Alaska Airlines, Delta Southwest and American also serve this route.